When traveling to Iceland be prepared to harsh and unpredictable weather. It can change every 15 minutes and during my trip I experience everything from sunny weather to windy and rainy conditions and even snowfall. It usually rains every day at least for few minutes so bring waterproof clothing with you. 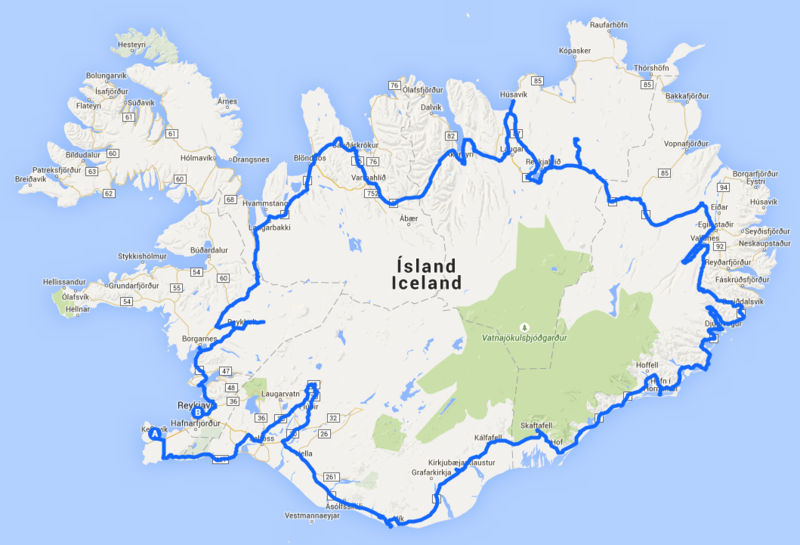 Approximate route of my trip around the Iceland. 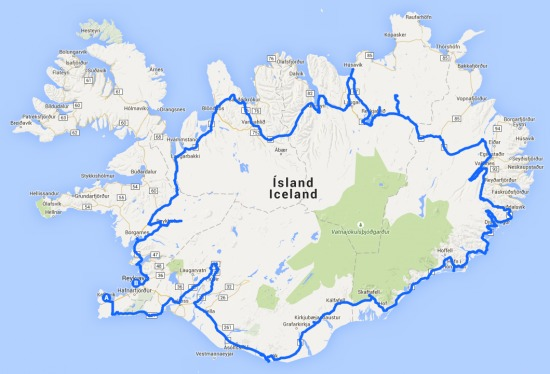 For my 12 days trip around the Iceland I decided to first take the ring road in the anticlockwise direction. 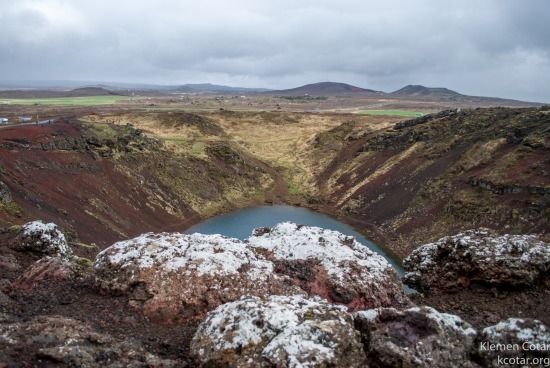 After leaving the Keflavik airport, the first obvious stop is the infamous Blue Lagoon and its colorful surrounding. 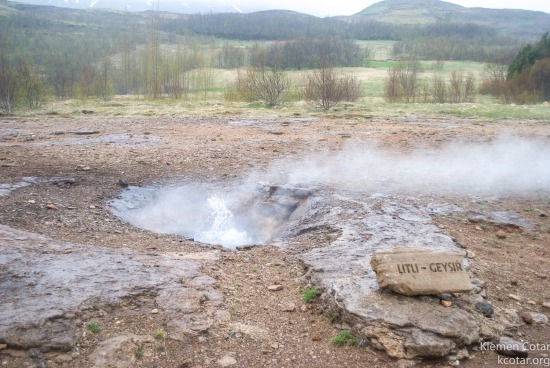 The next day led me to the Golden Circle area, with the stops at Geysir and Gullfoss waterfall. Starting from the Gullfoss the road (with proper 4×4 wheel drive car) leads to the highland landscape. Here I was able to see some of the largest rental jeeps meant for the exploration of the wilderness. There is plenty of water running around the country thus some of the next stops were connected with it. 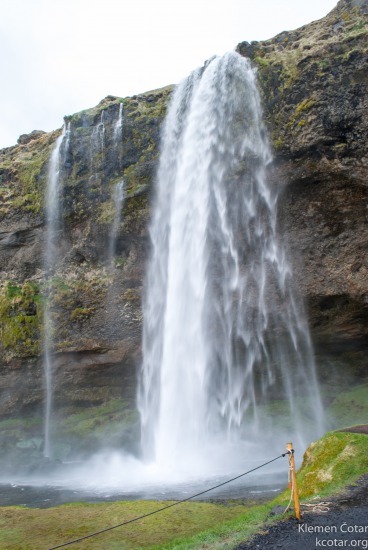 The first of them is Seljalandsfoss waterfall. It actually consists of multiple waterfalls separated by a few hundred meters. For the best view of the surrounding area you have to ascend on the top of the waterfall. Panoramic view from the top of the Seljalandsfoss waterfall. The next watery stop was at the Skogafoss waterfall. Most of the tourist here observes only the first waterfall of many upstream. Take your time here and go for a shorter walk and visit the other more distant one that are not visible from the main road. Strongly recommended! One of the Skogafoss waterfalls.